The Haas avocado was named after Rudolph Hass, who first planted the seedling and patented it in 1935. It is estimated that 95 percent of the commercial avocado production in the state of California is the Haas avocado variety, according to the California Avocado Commission. The tree offers excellent durability, ease of growth and a fruit that has a long shelf life. When ripe, the Haas avocado turns a dark purple that appears black, the skin becomes bumpy and the fruit feels slightly soft to the touch. Plant in a location that offers full sunlight for the best Haas fruit production. Plant the trees at least 30 feet apart and away from any buildings, ideally in well-draining, sandy loam. Dig a hole that is twice as large as the tree's root system. Remove all sod in a 3- to 10-foot circle around the planting location so the tree will not have to compete with turf grass for much needed nutrients. Plant the tree at the same soil level it was in its nursery container. Tamp the soil down around the tree's root system to remove all air pockets. Stake the tree with a garden stake, small diameter wooden pole or bamboo pole. Tie the tree to the pole loosely using cotton twine. The stake will help keep the tree from breaking in windy conditions. Apply 3 to 4 inches of peat moss or bark chips around the tree to help the soil retain moisture and keep weed growth back. Water the tree to keep the soil moist but not waterlogged until it is established. Fertilize one month after planting with 1/4-cup 10-10-10 fertilizer. Fertilize the second month after planting with 1 cup of 10-10-10 fertilizer. Water the fertilizer completely into the soil. Fertilize the tree four times a year, in the spring, summer, fall and winter, after the tree has been planted for one year. Spray the Haas avocado tree in March, May, June and August with a nutritional solution of copper, zinc, manganese and boron. Follow the directions on the label for application instructions. 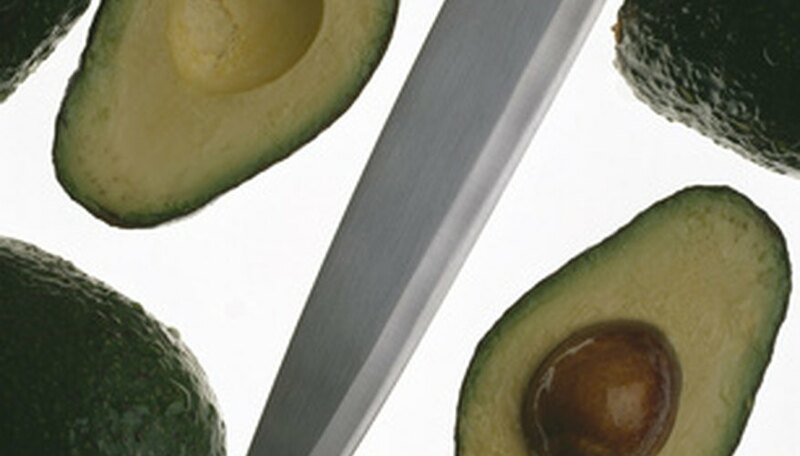 Prune the Haas avocado the first few years lightly to maintain appearance or to remove damaged branches in the spring. Prune the tree in the spring, removing the top limbs by 10 to 15 feet, when the tree is more than 5 years old. Avoid pruning any of the lower branches. Plant Haas avocados in the spring. The avocado can be planted year-round, but spring is the ideal time. Haas avocados are male and female trees, but they require a pollinator since they cannot self-pollinate.